There are a couple of things happening here. 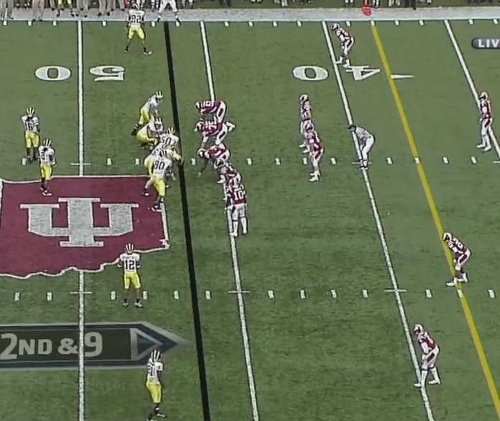 First, this was probably a terrible play call from Indiana. Regardless of what Michigan was doing on the ground, to give a man coverage look like this with no safety help, when Denard has proven throughout the year that he can make deep throws, is willfully stupid. Granted, it was good coverage and a great catch, but this is the sort of thing that happens in one-on-one coverage on an island. 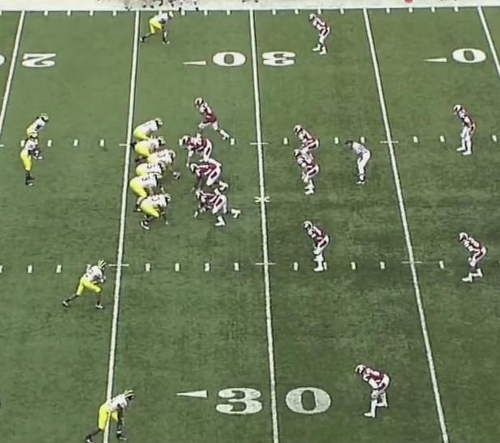 It was even dumber given that, even with the nickel back blitz, Indiana still only brought five players against Michigan's six blockers--which is why it's a little disappointing that Denard got hit as hard as he did on the throw. 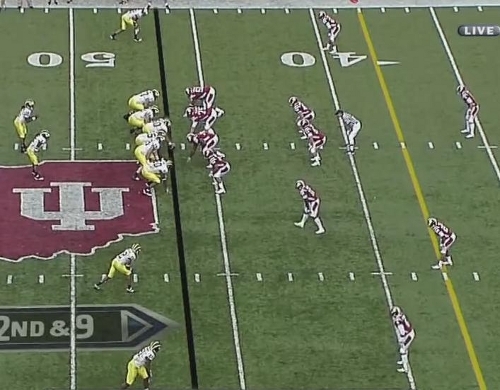 It's a tie game with less than a minute left and Michigan is able to get man coverage down the field in an obvious passing situation because Indiana is terrified of Denard's running ability. Either that's the worst play call of the year or Denard really is able to take it to the house on any play. Given what we know, it's the latter. So maybe it's not even close to the worst play call of the year. But the fact remains: How in the world do you put corners on an island and blitz less players than a team has blockers in a situation like that, especially given that Michigan's kickers are a combined 1/5 on the year? In that situation, you allow the running game to pick up nine yards at a time and take your chances with Michigan's kicking game. Finally, Rodriguez needs to come in for a lot of praise here. On the previous three plays, Michigan got up to the line of scrimmage, surveyed the field, and ran the play they had originally called. When Indiana finally showed a change, one that was favorable to Michigan, Rodriguez checked to the passing play that effectively won them the game. Lloyd Carr rarely if ever showed this kind of cat-and-mouse play calling. More importantly, this is twice in close games that Rodriguez has out maneuvered his counterpart to resounding effect. This is not a fluke occurrence. Good questions. I've been meaning to ask Brian about this for a while. Glad you enjoy the blog. If you do. Great analysis. Love the praise for Rich Rod - he deserves it. I think he is a great game coach and I believe we will see more killer instinct against state tomorrow. Good analysis here. I disagree a little bit though, with the conclusion. Indiana couldn't keep calling the same play and letting Denard run us down the field. Indiana got pressure with the rush. 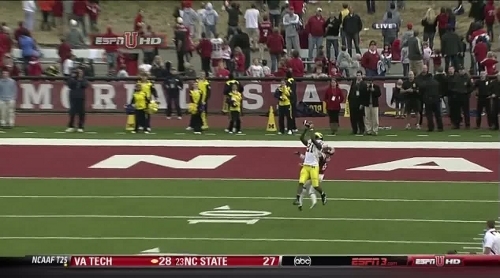 And while Denard HAS shown he can complete the deep ball, he's also shown he can miss it quite badly. If its me, I'd rather take my chances with Denard throwing up a jump ball than Denard running free. Denard put more air under the ball than usual (maybe on purpose, maybe thanks to the pressure) and Hemingway made the play. The ball also could have been picked off. The play worked out poorly for Indiana, but I think they'd make the same call again...maybe earlier in the drive instead of near the end of it. The defensive call didn't work but wasn't this what was Indiana was doing all game? I didn't scrub the tape but Michigan had a number of open deep passes that they didn't connect on. I had guessed this was because they were single covering the WR and walking a DB up to the line. Up to that point it had largely worked because Denard missed on the passes. With 2 TOs and 29 seconds, Denard could run several more times. There's every likelyhood he puts it in the endzone himself--to say nothing of the likely FG attempt. The one thing that stood out to me on this play was Denard knew he was going to get creamed and he stayed there, delivered a good pass and took the hit. Winners get it done despite possible pain. That showed more about Denard's leadership than all the great plays he has already made. It's one thing to run open field. It's another to know you are about to get your head taken off and you stay and do the job. Well done Denard. Nicely thought out article. Brian has a link to this in his mgoblog, which I am glad he did...like others I didn't know about this blog. I'll definitely booark and be a reader.